"What Broke really tells us is how systems of government, law and finance can crush even the hardiest of boot-strap pullers." —Brian Alexander, author of Glass House A galvanizing, narrative account of a city’s bankruptcy and its aftermath told through the lives of seven valiantly struggling Detroiters Bankruptcy and the austerity it represents have become a common "solution" for struggling American cities. What do the spending cuts and limited resources do to the lives of city residents? 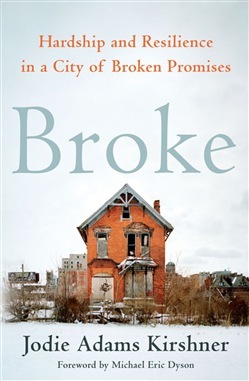 In Broke, Jodie Adams Kirshner follows seven Detroiters as they navigate life during and after their city's bankruptcy. Reggie loses his savings trying to make a habitable home for his family. Cindy fights drug use, prostitution, and dumping on her block. Lola commutes two hours a day to her suburban job. For them, financial issues are mired within the larger ramifications of poor urban policies, restorative negligence on the state and federal level and—even before the decision to declare Detroit bankrupt in 2013—the root causes of a city’s fiscal demise. Like Matthew Desmond’s Evicted, Broke looks at what municipal distress means, not just on paper but in practical—and personal—terms. More than 40 percent of Detroit’s 700,000 residents fall below the poverty line. Post-bankruptcy, they struggle with a broken real estate market, school system, and job market—and their lives have not improved. Detroit is emblematic. Kirshner makes a powerful argument that cities—the economic engine of America—are never quite given the aid that they need by either the state or federal government for their residents to survive, not to mention flourish. Success for all America’s citizens depends on equity of opportunity. Acquista Broke in Epub: dopo aver letto l’ebook Broke di Jodie Adams Kirshner ti invitiamo a lasciarci una Recensione qui sotto: sarà utile agli utenti che non abbiano ancora letto questo libro e che vogliano avere delle opinioni altrui. L’opinione su di un libro è molto soggettiva e per questo leggere eventuali recensioni negative non ci dovrà frenare dall’acquisto, anzi dovrà spingerci ad acquistare il libro in fretta per poter dire la nostra ed eventualmente smentire quanto commentato da altri, contribuendo ad arricchire più possibile i commenti e dare sempre più spunti di confronto al pubblico online.